Have you ever felt like you just don’t have enough time to get all of your work done? You’re not the only one. It’s something we all struggle with at one time or another. So what can you do to make the most of the time you have available? 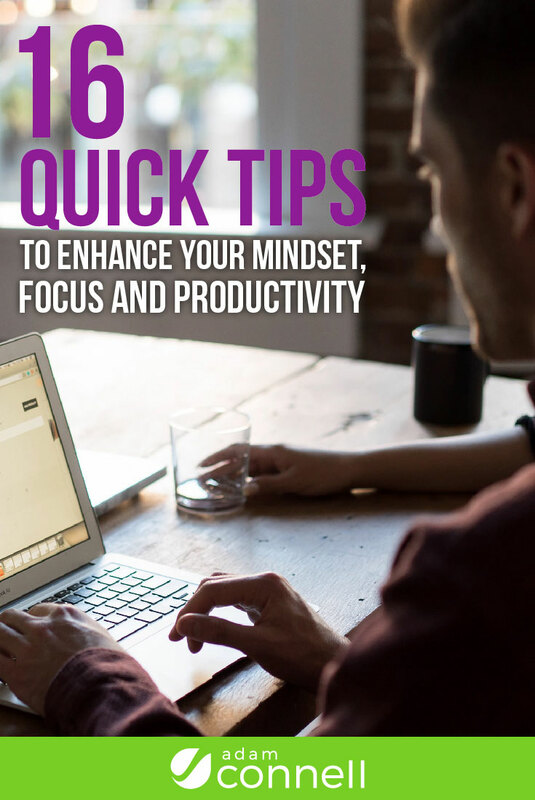 Below, you’ll find a collection of quick tips that will enhance your mindset, focus and productivity. How you start each day will largely determine how productive you are. If you feel like your body is resisting getting into work mode, don’t worry, that’s natural. Try starting each day with meditation, followed by exercise and you’ll notice your productivity improve. You could also include a few minutes to organize your workspace and time to go through the tasks you’ve got lined up for the day. There is no single schedule that will suit everyone. Most people fall into one of two camps – makers or managers. Makers work best when they have half/full day blocks of time to work on a project. Managers can easily switch up tasks every 30 minutes or so without it negatively impacting their productivity. This post by Paul Graham explains the concept in more depth. When you group similar tasks together, you can work through them with less friction. The idea is that you allocate blocks of time and work on similar tasks in each time block. For example, if you have several blog posts planned for the week ahead, you could do the research parts for each one in the same time block. What’s the main thing you want to get done in the next week? Sure, there are always a lot of smaller tasks, but when you focus in on very specific objectives, you’ll be able to work quicker. Every Sunday, try spending just 10-20 minutes to get your calendar sorted for the next week. It doesn’t have to be ultra-specific; all you need is some direction. Sometimes things don’t go to plan, so it helps to have a default diary that covers all of the critical blog management tasks. This also makes planning out your time easier. First, get clear on what you’re trying to achieve, then you can assign priorities to all of the smaller tasks that’ll get you to your goal(s). Every morning, I write out my to-do list onto a notepad that sits by my computer. This notepad never moves and it’s only ever used for this single purpose. I find that by writing out my task list, I’m more focused on what I need to do. Also, cross off tasks as you do them to build up a sense of momentum. I like to block out some time (maybe 30 minutes to an hour) in the afternoon for managing emails. This ensures that my day starts off my way and not as part of someone else’s agenda as most emails are. It also means that I’m not constantly checking emails throughout the day, which can be a huge drain on productivity. Things like the mainstream media present a disproportionate view of the negative to positive ratio of the world. Swap out these sorts of influences for ones that will inspire you. If you find yourself listening to music and singing along to the words, you’re distracted from the task at hand. Instead, try listening to music that has no words and is designed to improve your focus. I use Brain.fm which generates audio patterns scientifically proven to enhance focus and concentration. This is subjective. I know some people that prefer to work in silence – ultimately, go for whatever works best for you. Is there a task that you’ve been avoiding? The more we avoid things, the more of an issue they can become. Start your day off by completing one of these tasks and you’ll work through other tasks far easier. This doesn’t work for everyone – an alternative would be to start off working through small tasks to build up momentum. Try each approach and see what works for you. The key here is to take a balanced approach. Use too many (or the wrong) tools and they’ll just drain your productivity. Find a productivity tool that fits with how you want to work and stick with it – avoid the shiny object syndrome. I like using Workflowy for lists and Asana for team management. Because we work for ourselves, it’s easy to work crazy hours, but the truth is that work expands to fill whatever time you give it. So try giving yourself half the time and see how much more you can accomplish in that time. Focus on a single task instead, and see how it impacts your productivity. When we’re laser focused on the work at hand, it’s easy to become fully immersed in what we’re working on. That usually has a negative impact on productivity. The brain can only focus for so long without taking a break. I have a physical timer next to my computer that’s set to go off every 30 minutes to ensure I take my eyes off the screen – this helps me stay alert + maintain my focus. We’ve talked through a lot of tips here. And while most of them should be fairly quick to implement, don’t try to do too many at once. Start with a few and work your way up to see how they impact your productivity. While these have worked for me, it’s critical that you find what works for you. Some might, some might not but you’ll only know if you try. Note: This post originally appeared as a newsletter to my subscribers at BloggingWizard.com. Want to sign up? Click here to subscribe.